During our recent Board of Management meeting, Stephné Jacobs awarded board member Edith Venter with a special Board Member of the Year Certificate for her outstanding services to Reach for Recovery. 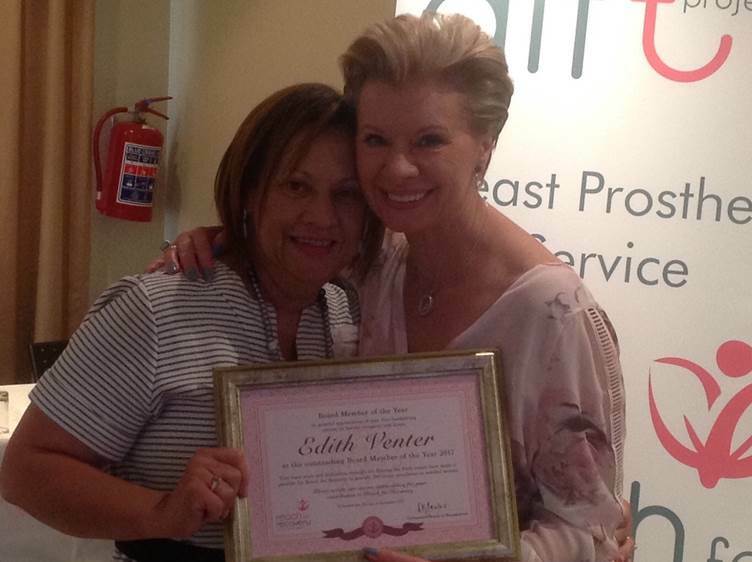 Edith Venter’s Playing for Pink Ladies Invitational Polo Event hosted at Inanda, Sandton in October 2016 raised R100,000 for our Ditto Prosthesis Support Project. A similar Board Member of the Year Certificate was given in absentia to Dr Karin Baatjes for her effort to raise more than R57,000 for our Ditto Project by registering as an activist on our GivenGain Donation page and raising the money through her participation in the West Coast marathon in 2016. We are so proud of these board members and their dedication to the breast cancer cause.